So this is the difference. 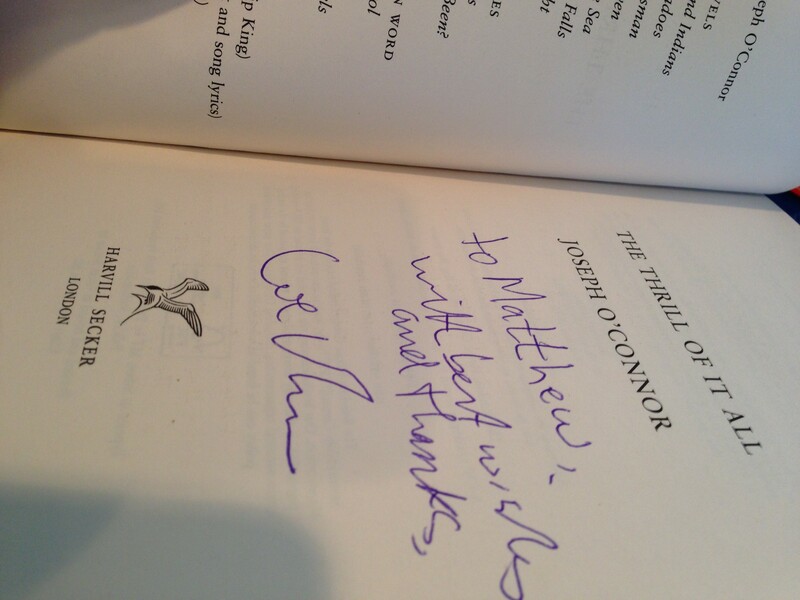 For a Joseph O’Connor book, this wasn’t his best, but it was still so so good. In Listowel this spring (2014 – http://wombatsdigit.com/w/2014/09/meeting-joseph-oconnor-and-anne-enright/) he talked at length about how he composes his books, how long it takes him to compose his books, how he speaks each sentence out loud to see if the cadence sounds right. *This* effort is what made the first… third of the book, where we get introduced to the players and their young selves and the author’s love of music of the seventies bearable. I would go so far as to say enjoyable, even, because of that level of care paid to the sentences that make up the book, though it does feel like a little indulgence on the part of O’Connor, pinwheeling down the lane. For example, the part that he read out at Listowel, in which a young Robbie Goulding comes home late and drunk and gets a bollocking by his dear old dad, was very musical and funny and finely tuned… except it was a little bit long. When the band comes together and moves to London things get really moving along and it becomes vintage O’Connor and I just got swept along by the current, instead of appreciating the technical details but lamenting the slow pace of the story. The people, Robbie, Trez, Fran, and Seán become living and breathing three dimensional characters and the story coalesces around Robbie and the thrill he’s had of it all. So if you’re up for a little slog in the beginning, maybe some beautiful sentences and paragraphs, you’ll pull through the other side into the kind of amazing stuff Joseph O’Connor regularly produces.